"Been thinking about Sir Frederic [Bruce] to-night," [Inspector] Duff [of Scotland Yard] continued. "Thinking about him, and the Chinese detective who ran down his murderer." Hayley nodded. "The chap from Hawaii. Sergeant Chan--was that the name?" "Charlie Chan--yes. But he's an inspector now, in Honolulu." "You hear from him then?" "At long intervals, yes." Duff lighted his pipe. "Busy as I am, I've kept up a correspondence. Can't get Charlie out of my mind, somehow. I wrote him a couple of months ago, asking for news of himself." "Yes--the reply came only this morning." Duff took a letter from his pocket. "There are, it appears, no news," he added, smiling. Hayley leaned back, in his chair. "None the less, let's hear the letter," he suggested. Charlie Chan is still in touch with his old friend Inspector Duff of Scotland Yard, who he first met in Behind That Curtain, and the two maintain a correspondence. The rain of the night before had ceased, but the morning was thick with fog. He sat hunched up in the little car, his eyes trying vainly to pierce the mist that covered the road ahead--the road that was to lead him far. 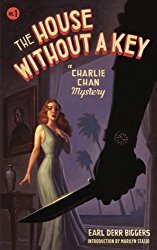 He had completely forgotten everything else--including his old friend, Charlie Chan. Nor was Charlie at that moment thinking of Duff. On the other side of the world this February day had not yet dawned--it was, in fact, the night of the day before. The plump inspector of the Honolulu police was sitting on his lanai, serenely indifferent to fate. From that perch on Punchbowl Hill he gazed across the twinkling lights of the town at the curving shore line of Waikiki, gleaming white beneath the tropic moon. He was a calm man, and this was one of the calmest moments of his life. He had not heard the jangle of the telephone on Inspector Duff's desk at Scotland Yard. No sudden vision of the start of that little green car had flashed before him. Nor did he see, as in a dream, a certain high-ceilinged room in Broome's famous London hotel, and on the bed the forever motionless figure of an old man, strangled by means of a luggage strap bound tightly about his throat. Perhaps the Chinese are not so very psychic after all. The victim is a member of a cruise that is traveling around the world with some ports-of-call-on-land sites. Doctor Lofton has coordinated the trip and wants to avoid the party being detained. The traveling companions are all questioned but there is not enough evidence to hold anyone, so Scotland Yard allows the party to continue. It is Inspector Duff’s responsibility to solve the case so he needs to keep tabs on the itinerary of the cruise. Dispatching Duff to travel with them is, however, unwarranted at this time. As the cruise continues, a second murder occurs on the ship, and a third murder occurs on shore to a man who is related to the second victim, who Duff is escorting when she is shot. Scotland Yard is now justified in sending an agent to accompany the tour but, since Inspector Duff is known to the cruise members, another officer is sent. This officer is murdered on the docks in Yokohama. Duff was smiling again. "Very well planned, sir. But may I make one suggestion?" "I should like to meet the party at Honolulu, sir." "It would give me that last run from Honolulu to the mainland, sir. Some of them may leave the party at San Francisco. And furthermore--"
"I have a very good friend at Honolulu. A chap of whom I'm particularly fond. I believe I've spoken to you about him--Inspector Chan, of the Honolulu police." The superintendent nodded. "Ah, yes. 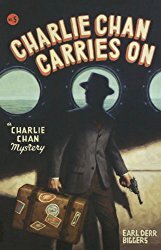 Charlie Chan—the Bruce case. Do you think Inspector Chan would like to see you, Duff?" Duff was piled. "I'm sure he would, sir. Why do you ask?" His superior smiled. "Because I have long wanted to do a favor for Mr. Chan. Don't worry, my boy. Honolulu can undoubtedly be arranged." A Chinese does not, as a rule, register surprise, and a good detective learns early in his career the wisdom of keeping his emotions to himself. When you get the two in one package, as in the case of Charlie Chan, you are likely to have something pretty imperturbable. Yet now his eyes widened amazingly, and for a moment his mouth stood open. One would have said that he was, at the least, slightly taken aback. In another moment he had leaped nimbly to his feet, and was moving swiftly toward the door. "My celebrated friend," he cried, "for an instant I question the reliability of my sight." Smiling, Duff held out his hand. "Inspector Chan!" Charlie took it. "Inspector Duff!" The Britisher tossed a brief-case down on the desk. "Here I am at last, Charlie. Did I surprise you? I meant to." "For a brief space the breath left me," grinned Charlie. "Putting it more forcefully, I might say I gasped." He held ready a chair for his visitor, and inserted himself again into the one behind the desk. "I had so long desired this tremendous honor and happiness that I feared I endured hallucination. First question is now in order. What is your opinion of Honolulu, as far as you have got with it?" Duff considered. "Well, it seems to be a nice clean town," he admitted. Chan was shaking with silent mirth. "Almost I am drowned in the flood of your enthusiasm," he remarked. "But with you it is deeds, not words, I know. Busy man like yourself has no time for tourist nonsense. I make the wager you are here on case." The other nodded. "I certainly am." "I wish you no bad luck, but I am hoping you must remain for a lengthy visit." "Only a few hours," Duff replied. "I'm here to meet the President Arthur at this port to-morrow morning, and I expect to go out on her when she sails for San Francisco to-morrow night." Chan waved a hand. "Too brief, my friend. I am desolate to hear it. But I too know call of duty. You have, no doubt, a suspect on the ship?" "Seven or eight of them," Duff answered. "Charlie, I've had suspects on boats and trains and at railway stations and hotels until I feel like Thomas Cook, or at least like one of the sons. I'm on the strangest case--as soon as your work permits, I want to tell you about it." Charlie sighed. "Even if story requires one week to relate," he replied, "I possess plenty time to listen." "Not much happening in your line, you wrote me?" "The Indian philosopher who sat under one tree for twenty years was offensive busybody compared with me," Chan admitted. Duff smiled. "I'm sorry. But perhaps in that event you can think about my troubles a bit, and it may be you can make a few suggestions." The Chinese shrugged. "Does the mosquito advise the lion?" he inquired. "But I burn to hear what brings you to this somnolent paradise." "A murder, of course," Duff answered. "A murder in Broome's Hotel, in the city of London, on the morning of February seventh. Other murders too along the way, but only the first concerns me." And he launched into his story. While Duff is chatting with Charlie, someone shoots him through a window. Duff is hospitalized but is expected to recover. He is coherent enough to request that Charlie Chan carry on his investigation. It is inevitable that Chan solves the case but before he reveals his solution a young woman asks if he knows who the murderer is. Chan replies, “I do, and you should know who it is, too. Once again, Earl Derr Biggers shows himself to be a master of creating a complicated plot, keeping the reader’s interest, and telling a good story.